Are there really more fish in the sea? I'm really happy to hear you liked the bad route, since this was my first attempt at writing horror! Hopefully I'll get another chance to write darker stuff in the future. Thank you very much! Writing realistic child characters is difficult, but in this game they were very believable! I pretty much instantly cared about all of them, especially Noel and Nova. I also loved the little details in the children's unique art styles! I got the worst ending first, then slowly worked my way up, and it really made me appreciate the occasional foreshadowing. Excellent work, thank you for creating such an enjoyable experience! I'm sorry for the inconvenience, the bug should be fixed now. Thank you for letting me know! I had a lot of fun and truly think you have a gift for making puzzle games! Can't wait to see more! This has been a truly exciting and educational experience for me, and I can't wait to participate in another jam again soon. I hope you'll enjoy the game and let me know what you think! Fortunately there's not much to say anymore. I drew a little ending card for each love interest, and will be done with the writing soon. So after some testing, I should be able to release the game tomorrow! I'm glad you enjoyed it! Watching your video also helped me figure out some minor changes I want to make (such as adding my own name to the credits, oops!) so thank you for that. Your support means a lot! Today will be another short update, but I finally managed to crawl out of my writer's block! I figured out a nice way to tie all introductory quests together, which then leads to further branching paths. My goal is to hopefully give each character a little ending scene, and the 30 minutes being reached through multiple playthroughs. After some deliberation I also think I will most likely scrap the "phone feature" i was so proud of at the beginning. It kind of hurts, but it doesn't really add fun OR difficulty, so I don't see why I should keep it. Maybe I'll find some use for it in a different project, though! It's very late so I'll keep this short and sweet. I finished all of the remaining graphics, came up with a name (finally!) and polished everything I had so far. ...We now have a stunning 10 full minutes of gameplay. That sounds like huge progress to me! The money moving from the table into the GUI is a nice touch. As for food that could work in this resolution... Maybe cake, pizza or something with fish? I'm definitely interested in this game and I'd love to play the final product! Keep it up! When I don't feel like writing, I draw. And when I don't feel like drawing, I make pixel art. But the problem is, I always feel like doing pixel art, so this process can turn out to be a dead end. But I overcame that today! I wrote a new quest, moved on to draw the last two face graphics, added facial expressions to the vaquita and sea bunny slug AND added a credits page. I'm glad I got this done today, because I would hate to accidentally forget crediting someone just because I have to put something together last-minute. Now only 2 more characters need facial expressions. The rest of the time I can spend on writing as much of the story as I can! That musical sheet looks incredible! I can imagine it must've been hard to draw a treble clef with such little space, but it turned out really well. So, concerning my goal of "making just as much progress tomorrow"... Unfortunately procrastination has gotten the better of me. The day started off strong by completing the fifth character, the sea bunny slug. And making his "ears" twitch. Other than that, I've been working on setting up my Itch profile, and finally posted my first project! I've been wanting to get that out of the way for a while now, so I guess this is still progress, even if I didn't add much to the game today. I feel like today was a big turning point because my game went from "some maps you can walk around in" to an actual game! We now have our first "quest" the player has to complete! Though don't worry, there's gonna be more to it than just a string of quests. I want the game to be as non-linear as possible, leaving it up to the player what they want to do first. This makes programming a little trickier, but I'm here to learn new things! The hammerhead shark now got her introduction and it was a lot of fun (but also scary) how her personality was pretty much shaped by itself. I also gave the sea dragon's personality a fun twist - gap moe, if you will. Other than that, we now have... Facial expressions! The default faces didn't really fit with some of the dialogue, so I figured something had to be done. I'm hoping I can make just as much progress tomorrow! What a cute concept! If you need help with RPG Maker, I (and probably many others) can help you out in the jam's Discord chat! Today will look like a short update, but I got a lot of stuff done behind the scenes. I finished 2 big maps, figured out how to make bridges work and wrote an introductory scene for the weedy seadragon! And everyone now has a profile page. For now it simply offers "fun facts" on the species, but I might think of other things to write. Also, we are now dealing with these guys: I figured I'd make the world more lively by adding some npc fish. Tomorrow I aim to make 2 more maps and write another character introduction. Had to do some IRL stuff, so i couldn't get as much work done as I wanted to. I also made some starfish tiles and designed the first male love interest, everyone's favorite nearly-extinct porpoise: the vaquita! He's secretly goth but he's wearing a Hawaiian shirt to fit in. Time for Day 2. Thank you very much for the kind words so far! I also designed 2 more characters: amazonian manatee and sea dragon. There will be 3 female and 3 male love interests (probably). Tomorrow I aim to design the rest of the characters and make some coral/starfish tiles to make the world more colorful. Hello! This is my first time participating in a game jam so I'm very excited to be here! I actually started working on a project yesterday, but I scrapped that idea so I'm counting today as Day 1. 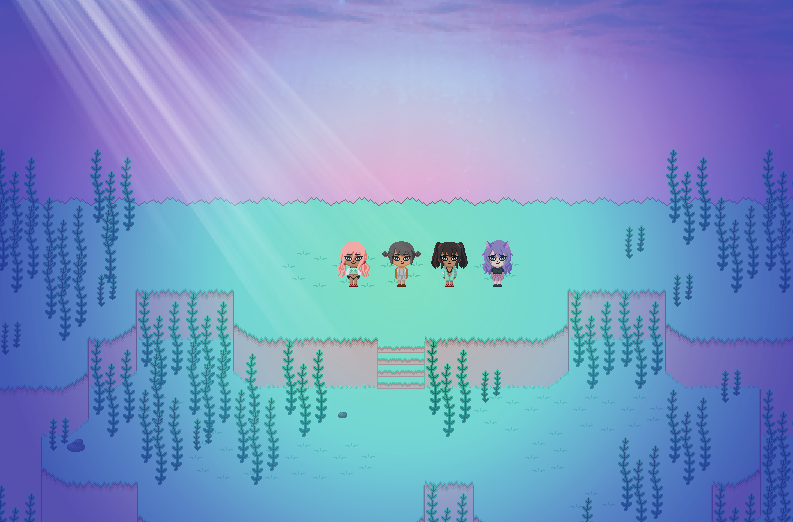 I'm making the game in RPGMaker. There will be no battles since I want to focus on the story and character interactions. 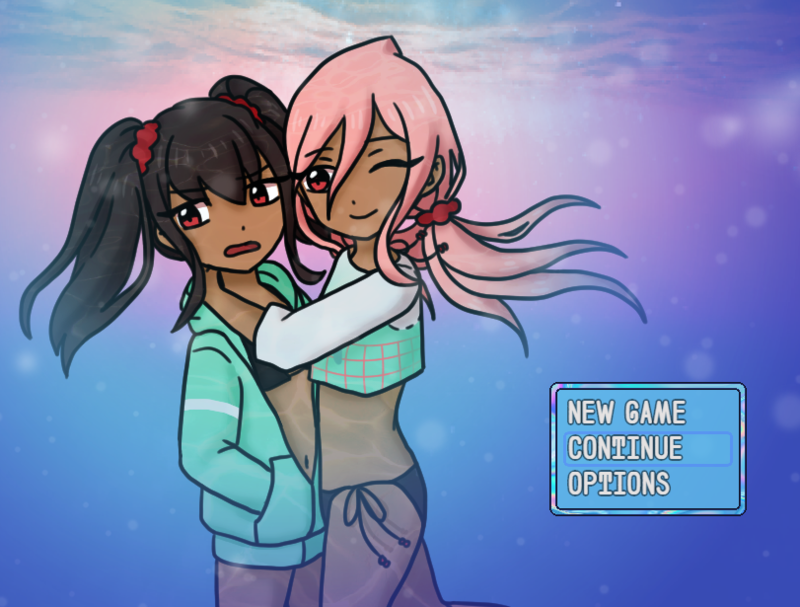 The main character is a (humanized) pink dolphin and all other characters will also be based on sea creatures. Considering the pink dolphin's role in mythology (and its color scheme, lol), I'm playing with the idea of making it a dating sim. Next step will be making various plants, rocks, and buildings. Also figuring out how to achieve a more underwater-y atmosphere, since a light blue overlay isn't really doing it for me.